T oday, we’re living in a different world. Consumers now have access to and demand more healthcare options. For middle-market healthcare services companies, the rise of healthcare consumerism will shape how business is conducted in the future and present a host of M&A interest in organizations that embrace a consumer-friendly business model. In the not-so-distant past, consumers had little control or options when it came to healthcare. Essentially, the family doctor was the keeper of patient health records and medical knowledge. For the employed, the level of care received was dictated by a health plan that the employer chose, and the unemployed received the level of care their bank accounts could withstand. In the past several years, consumers have slowly taken more control of decisions regarding their healthcare. This trend, or movement, is often referred to as healthcare consumerism. Consumerism can provide widespread opportunities for middle-market healthcare services companies if they can capitalize on the trend. 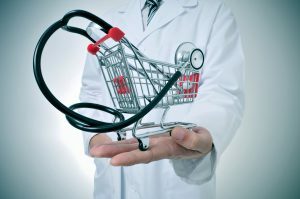 How did healthcare consumerism come about? A number of factors have contributed to this shift from consumers accepting the healthcare services and advice offered (with few to no questions asked) to taking the reins in decisions pertaining to their health. Digital knowledge brought power to consumers. People feel more confident about weighing options when it comes to healthcare services and providers today, due to the abundance of free medical content available online. From researching health conditions and medical products to reviewing doctor, hospital or clinic ratings – consumers have access to endless information online to help them make decisions. Affordable Care Act (ACA) provisions changed the healthcare landscape. As the ACA started rolling out, patients were empowered when they gained ownership of their own electronic health records (EHRs). The primary care physician will no longer be the gatekeeper, which helps give consumers more options with less hassle. With the ACA, consumers also have a vast number of health plan options to consider through the government’s Health Insurance Marketplace. To be competitive, healthcare insurance providers now need to realign product/service offerings and marketing efforts to highlight consumer-friendly, cost-effective options. The ACA also put the squeeze on hospitals and health systems with new readmission penalties, leading to a drop of nearly 70,000 readmissions in 2012.1 In order to stay compliant, hospitals must make process adjustments and look for ways to reduce costs to remain profitable. With HDHPs, consumers foot a larger portion of the bill for healthcare services. This often results in consumers making more cost-conscious choices outside of traditional medical settings or delaying elective or costly procedures. Why is healthcare M&A activity heating up with the rise of consumerism? Saving time (and money), because the investor doesn’t need to reinvent the wheel. Access to business intelligence or technology that will take them to new heights. A cost-effective way to offer new medical services that are cost-prohibitive under present circumstances. Access to consumer-friendly products and services that enhance current offerings. A fast track to growing their organization’s footprint in the target market. If you own a middle-market healthcare services company that offers consumer-friendly services – you’re in the right place at the right time. Consumers are looking for services like yours and M&A opportunities are plentiful. An investment banker who understands the complexities of the changing healthcare landscape can be a great resource if you would like to discuss selling all or a portion of your business. 1. “Factors affecting 2014 Medical Cost Trend.” PricewaterhouseCooper website, www.pwc.com. Available at http://www.pwc.com/us/en/health-industries/behind-the-numbers/#readmore. Accessed May 29, 2014. 2. “Health Care Spending Growth Slowed in 2012, But Consumers Continued to Spend More Out-of-Pocket, Says New HCCI Report,” [press release]. Sept. 24, 2013. Washington, DC. Health Care Cost Institute. Available at http://www.healthcostinstitute.org/news-and-events/press-release-2012-health-care-cost-and-utilization-report. Accessed May 29, 2014.